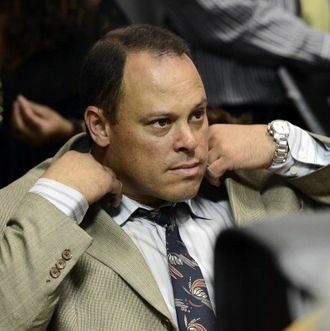 Depending on who you ask, the reassignment of the top detective in the Oscar “Blade Runner” Pistorius case is either a “speed bump” for the prosecutors who say he murdered his girlfriend, or the start of a “monumental collapse” of their case. Prosecutors, naturally, downplayed the significance of Detective Warrant Officer Hilton Botha’s reassignment after it emerged that he faced attempted murder charges of his own for allegedly opening fire on a minivan full of people. But the defense says their case is crumbling. Even if he gains bail in the hearing set to resume Friday, though, Pistorius is still in a lot of trouble. Regardless of how his legal troubles shake out, this has already been a financial disaster for Pistorius, who had been making $2 million a year in endorsements, CNN Money reports. Nike dropped its endorsement on Thursday, after Oakley dropped him earlier in the week. Thierry Muggler also suspended its arrangement with the Olympian. Apparently there is such a thing as bad publicity.